In a Facebok post actress Poojana Pradhan has told that she received a request from the recent release movie ‘Kabaddi Kabaddi’ to delay the release of her movie ‘Chocolate’. 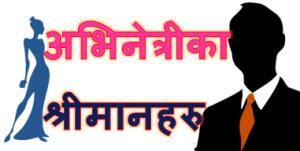 The sequel of hit movie ‘Kabaddi’ is doing well in theater. 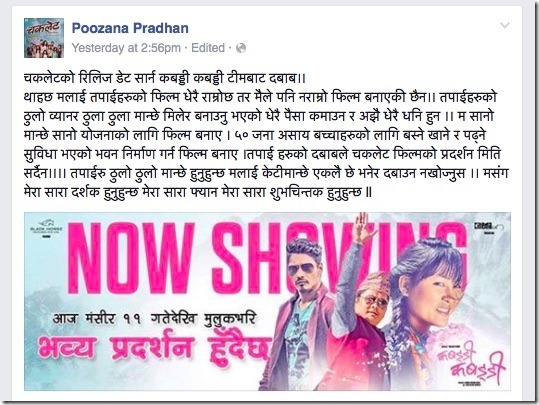 In a Facebook post, Poojana has claimed that her movie is also good enough to compete with the movie. Poojana has accused the ‘Kabaddi Kabaddi’ team of harassing her. She has told that the proceeds from the movie will go towards constructing a building to house 50 kids for their living and education. The debut movie of Poojana as a producer is releasing in theater on December 4. The movie is expected to release in 21 theaters including the multiplex theaters. It seems, Poojana is trying to cash in the popularity of ‘Kabaddi Kabaddi’ to promote her movie. In the past, Poojana had used skimpy clothes and bed scenes to promote her movies. 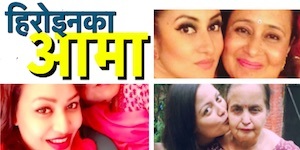 She was highly criticized for the bed scene photos and videos released before the released of her movie ‘Rakshya’ (Watch ‘Rakshya’ in xnepali). 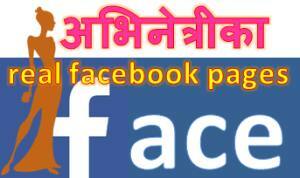 This entry was posted in Gossips and tagged chocolate, Kabaddi Kabaddi, Poojana Pradhan. Bookmark the permalink.